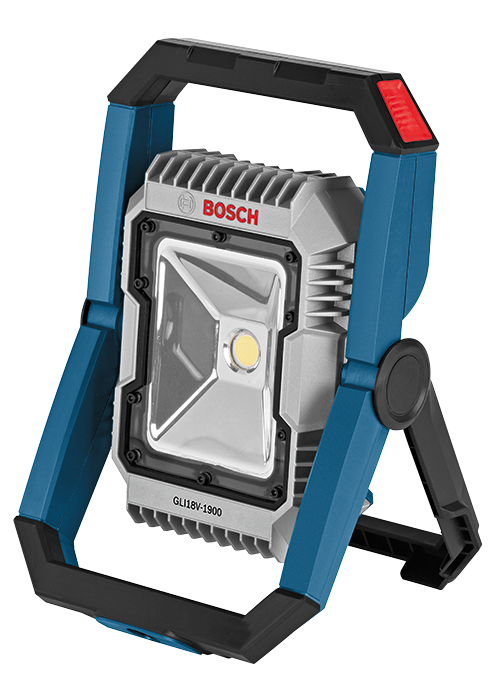 The Bosch GLI18 V-1900N 18 V LED Floodlight allows users to illuminate virtually any work area at any time of day, with a compact, carry-along tool. It provides an outstanding 1,900 lumens, which will effectively illuminate a large workspace. It offers complete compatibility with any battery in the Bosch 18 V Lithium-Ion system. This floodlight has a 1,000-lumen brightness setting, which provides longer operation, allowing the light to run up to ten hours on an 18 V 6.0 Ah battery (not included). It features a swiveling stand that provides five working angles, so users can adjust the lamp so the angle is just right. The stand also acts as a protective frame for enhanced durability, and it includes a 5/8 In. -11 thread mount for compatibility with standard tripods.